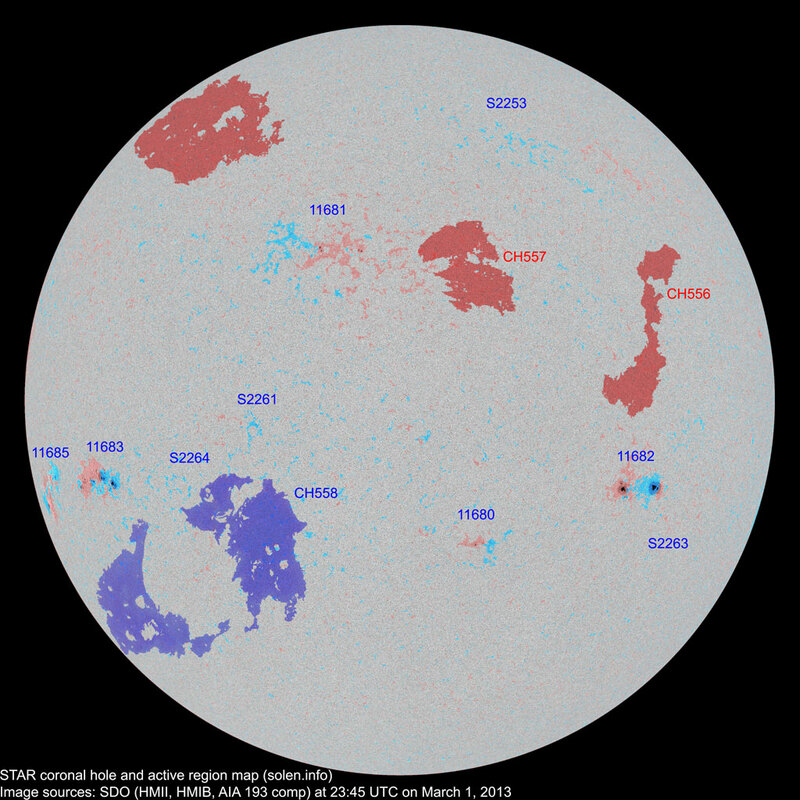 Last major update issued on March 2, 2013 at 06:35 UTC. 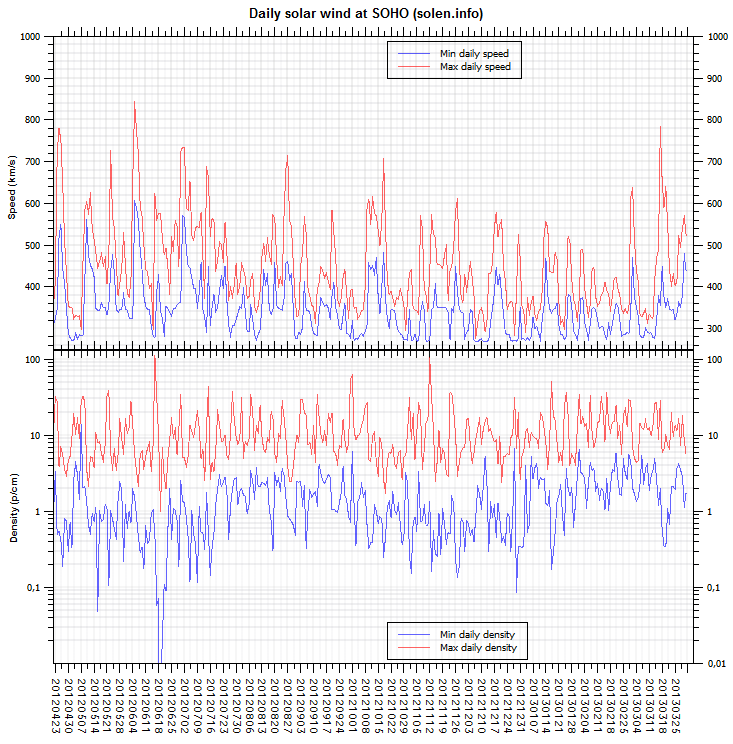 The geomagnetic field was active to minor storm on March 1. 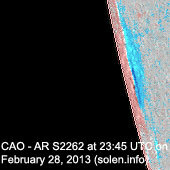 Solar wind speed at SOHO ranged between 348 and 615 km/s under the influence of a high speed stream from CH556. 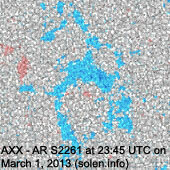 Solar flux measured at 20h UTC on 2.8 GHz was 112.6 (increasing 0.8 over the last solar rotation). 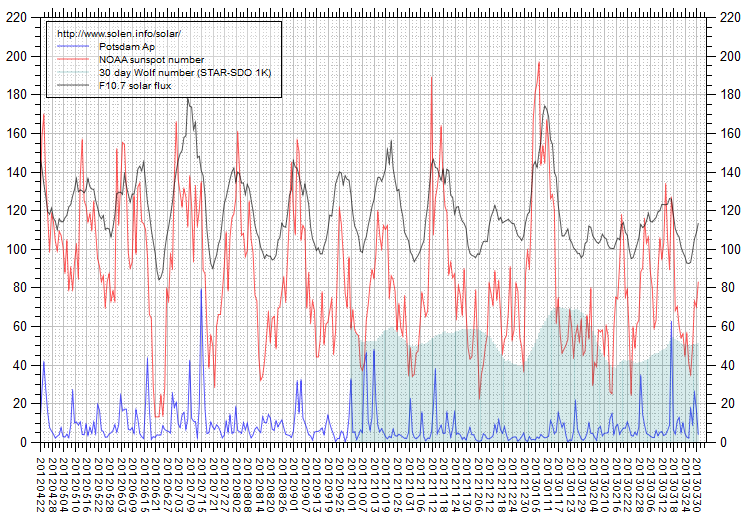 The Potsdam WDC planetary A index was 33 (STAR Ap - based on the mean of three hour interval ap indices: 33.0). 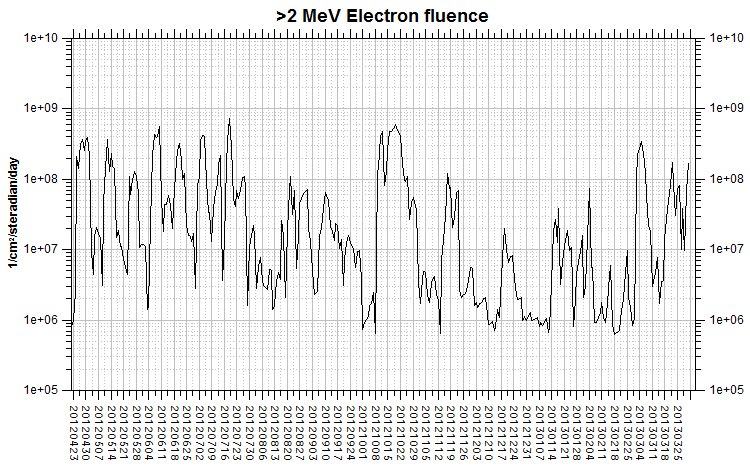 Three hour interval K indices: 44455444 (planetary), 54354433 (Boulder). 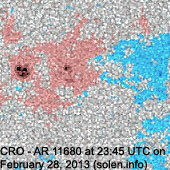 Region 11680 [S29W13] was quiet and stable. 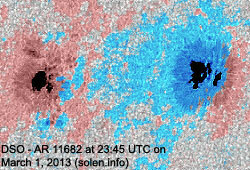 Region 11681 [N17E09] was quiet. 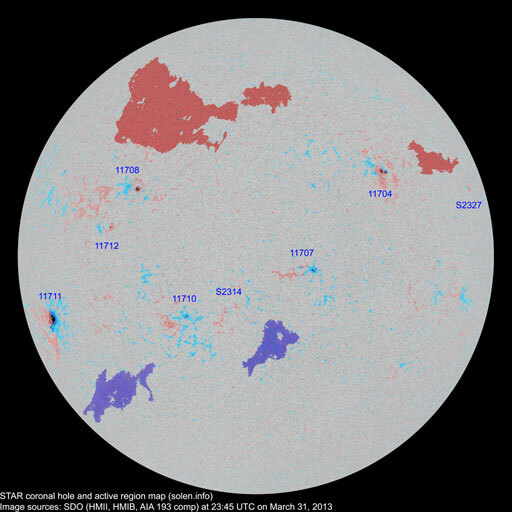 Two new spots emerged in the easternmost part of the leading polarity area. 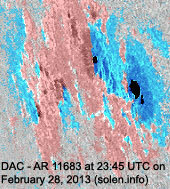 SWPC / USAF chose to number these spots as AR 11684. 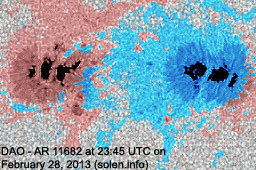 Region 11682 [S19W42] was quiet and stable. 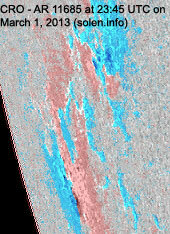 Opposite polarity penumbra spots are poorly separated in the southern part of the trailing spot section. 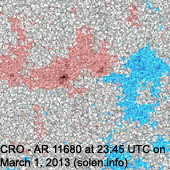 Region 11683 [S16E56] added spots and has minor polarity intermixing. 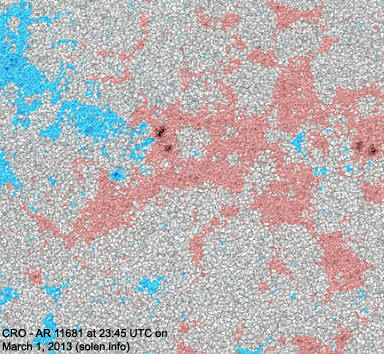 C flares are possible with a low chance for a minor M class event. 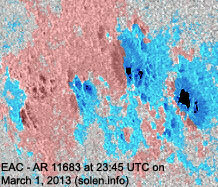 New region 11685 [S15E75] rotated partly into view on February 28 and was numbered the next day by SWPC. 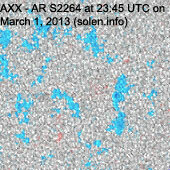 S2253 [N41W20] reemerged with a penumbra spot in the northeasternmost part of the trailing polarity area. S2261 [S10E23] reemerged with penumbra spots. 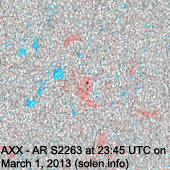 New region S2263 [S23W50] emerged to the south of AR 11682. New region S2264 [S19E37] emerged with a penumbra spot. 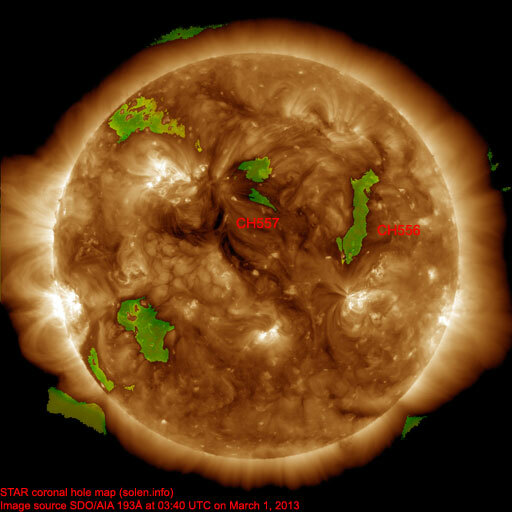 The geomagnetic field is expected to be unsettled to active on March 2 and quiet to active on March 3-5 due to effects from CH556 and CH557. 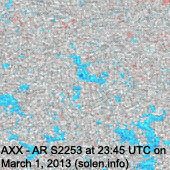 Another disturbance, associated with CH558, could start on March 6.